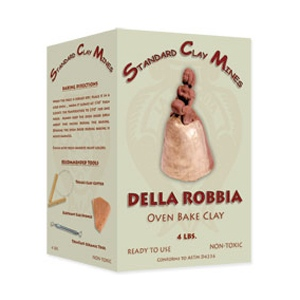 * Our Della Robbia self-hardening clay adds a twist to the sculpting process. * It is no longer necessary to use a complex kiln to "fire" your clay. * Simply let Della Robbia air dry; then bake it slowly in a 250 degree kitchen oven to achieve more durability. * After baking, decorate with regular paint to give it a matte or glossy finish. * Della Robbia will maintain its pliability if kept moist while working it; if taking short breaks, we suggest covering it with a damp cloth so it keeps its plasticity. * Color: Deep Rich Brown. Please note, since Della Robbia is not a pottery clay, it will not become vitrified and, therefore, will remain porous. Any modeled piece is for decorative use only.